There were cowboy boots and stetsons aplenty at the Cliffs Pavilion, Southend on Thursday night. And that was just the members of the audience, all raring to mosey on down to the music of the King and Queen of Country, Dolly Parton and Kenny Rogers with the Islands in the Stream show. Islands in the Stream, of course, is the hit song by the country singing duet and it obviously seemed to make sense for these two to pair up for this tribute act. Now unlike a lot of tribute acts I've seen of late, these two would have you believe they are the real deal. In fact, I have no idea what their real names are (admittedly I didn't get a programme) and at no time during the evening did they come out of the Dolly or Kenny persona, so perhaps they are more of an impressionist act - I don't know - it doesn't really matter because once you allow yourself to indulge in 'Dolly' and 'Kenny's' sheer enthusiasm and enjoyment at being these icons of country music, you just accept it and go with the flow. The evening starts off with the couple singing Islands in the Stream and throughout they take it in turns to provide a set of songs individually, which works rather well. Not only do they sing like Dolly and Kenny, they speak like them too - Dolly, all girlish giggles and sassy self deprecation, and Kenny, all gruff and endearing. When he sang the romantic ballad, Lady, he told the ladies in the audience that he was going to sing it to whoever's eyes he was looking at, at the time. "Not the men's though, I'm not like that," then quick as a flash, "My boyfriend is but I'm not!" Hoots of a laughter all round. And that's the joy of the evening. Not only do you get to hear the great songs from this pair, you also get an awful lot of laughter from them too. Dolly makes jokes about her husband, suggesting that it maybe would be nice if Jolene had got her man all those years ago, because now he just falls asleep on his La-Z-Boy chair and snores too loudly. These two are clearly experienced performers and really know how to work a room and the audience couldn't get enough of them with plenty of whoops of appreciation and yee-ha's. They also look pretty close to the real deal, although to be fair I was sitting at the back of the stalls. Dolly's costumes looked as fabulous and the real lady's and she certainly carried off the heels well. The evening really kicked off when Kenny sang Ruby and of course the Dolly fans were thrilled to hear Jolene and Butterfly just before the first act came to a close. The best songs were left for the second half of the evening with Kenny singing Coward of the County, Lady, Lucille and of course The Gambler and Dolly returning for a duet of the song the real Kenny sang with Sheena Easton, We Got Tonight followed by, one of my favourite's Here You Come Again, Stand by Your Man, and with almost everyone up on their feet by this stage, the hit song 9 to 5 and ending with the the iconic, I Will Always Love You. Knowing how to leave an audience wanting more, they finished with the song that began the evening's proceedings, Islands in the Stream with everyone up on their feet, singing along and dancing in the aisles. The show's promoters, Southend based company, Entertainers, certainly seem to have the monopoly on tribute acts right now with other tribute acts on their books such as George Michael, Stevie Wonder, Sting and Elton John. 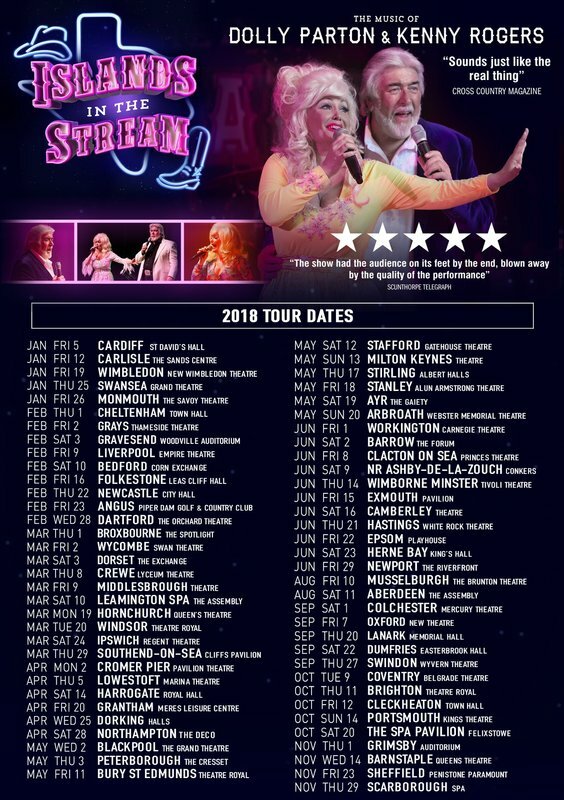 It's a niche that seems hugely popular with audiences right now and Islands in the Stream certainly ticks all the boxes for a feel good, don't take yourself too seriously, fun night out!